RE is taught as part of the basic curriculum but is not in the National Curriculum. Legally, it has to be taught according to a locally agreed syllabus prepared by a specially convened standing conference. At Gateway school, RE is taught within the framework of the Westminster Agreed Syllabus. The requirements set out in this syllabus indicate that a minimum of 5% of curriculum time should be used for teaching RE. This amounts to 45 minutes each week in Key Stages 1 and 2. RE must be provided for all registered pupils at school, although parents do have the right to withdraw their children from RE lessons. Should any parent wish to exercise this right they are asked to speak to Ms Lochner, the Headteacher. Broadly, the aims of RE are consistent with the non-statutory QCA attainment targets. Firstly, it aims to develop knowledge and understanding of Religion (learning about religion) and, secondly, to explore and respond to human experience (learning from Religion). The Westminster Agreed Syllabus meets these requirements and uses the study of several major world faiths to explore a wide variety of topics. For children in the Foundation Stage, RE teaching is integrated in the Early Learning Goal relating to Knowledge and Understanding about the World. Children learn about basic themes such as celebration, new life and family and explore these concepts within different religions, primarily through storytelling and class discussion. For example, when learning about celebration, children will discuss the different types of celebrations they have encountered (birthdays, Eid, new birth) before finding out about important dates celebrated within a particular religion, i.e. Christians celebrating the birth of Jesus. The children’s developing thoughts and ideas are recorded in a class ‘big book’. In Key Stage 1, RE is taught distinctly on a weekly basis. Children learn about concepts such as ‘change’, ‘specialness’, ‘belonging’, and ‘ritual’, by considering their own experiences of these themes and then relating these ideas to religious contexts. For example, in Year 1 children learn about special people in their lives and then relate this to special figures in different religions. Christianity and Judaism are the main religions taught within this Key Stage. In Key Stage 2, RE lessons are also taught weekly. The main religions taught within Key Stage 2 are Islam, Christianity and Hinduism. 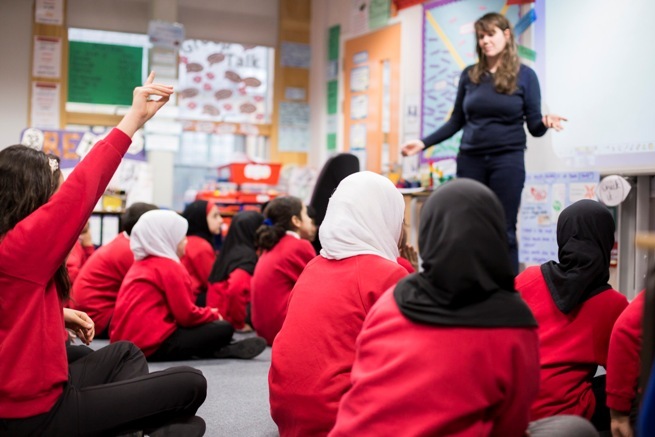 Children learn about religious concepts in more detail using a range of teaching and learning strategies, such as brainstorming, drama and hot-seating, class discussion and debate, re-telling, sequencing and ordering pictures and extended writing activities. Links are made with the learning across many curriculum areas, particularly Literacy, History, PSHCE and ICT.